Along with every other music junkie, I was ecstatic to see all the line ups for all the upcoming music festivals. But as all other music junkies, I wished I had sufficient money to pay for all of them. Music makes culture, whether jazz or hip-hop or indie and house they all are different, for different societies and cultures. Every festival has people, music, and different energies that are transmitted throughout. They are an experience that for some only comes once a year. As of now, line ups have been release for festivals like Firefly, Bonnaroo, Suburbia and plenty more. From June 19th to the 22nd, Dover, Delaware will be filled with bands anywhere from The Lumineers to Arctic Monkeys. The general admission four day passes are about $259. It is on the pricy side, but it is well worth it for four days of all your favorite artists. The Governors Ball music festival is more of a house music/Indie music festival. The festival takes place at Randall’s Island, NYC. The tickets are priced within a range of $250 to $530 for three day general admission or three day VIP admission. The festival will be from June 6th-8th and it will feature artists like Skrillex and Phoenix. The Suburbia music festival will be held in Plano, TX from May 3rd to the 4th. It will feature music from artists like Alabama Shakes to David Guetta, and Hoodie Allen. The two day general admission is $99.50, and if you ask me, that is a very fair price for two days and more than forty artists. 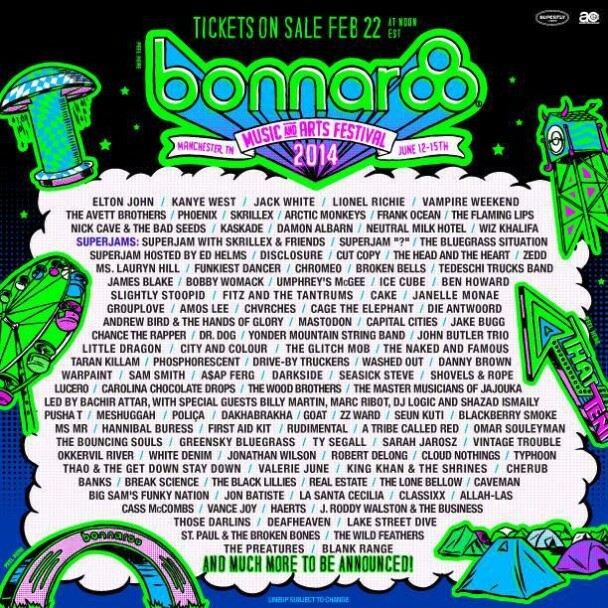 And last but certainly not least, Bonnarro. This is a four day music festival in Manchester, TN. The tickets are $249 for the four days, general admission. The lineup ranges anywhere from Lionel Richie to Vampire Weekend, and Zedd. I’d say that this festival is very much worth what it is priced and it is for people with almost all tastes in music. It is very diverse and it really is a great experience. There are plenty of other music festivals and concerts this year but these are just the few that stood out to me the most. Many music festivals are once a year but many of them happen all throughout the year. This entry was posted in Feature and tagged bonnarro, festival, firefly, music, music festival, suburbia, the governors ball. Bookmark the permalink. Reblogged this on The Galleria of Maria.